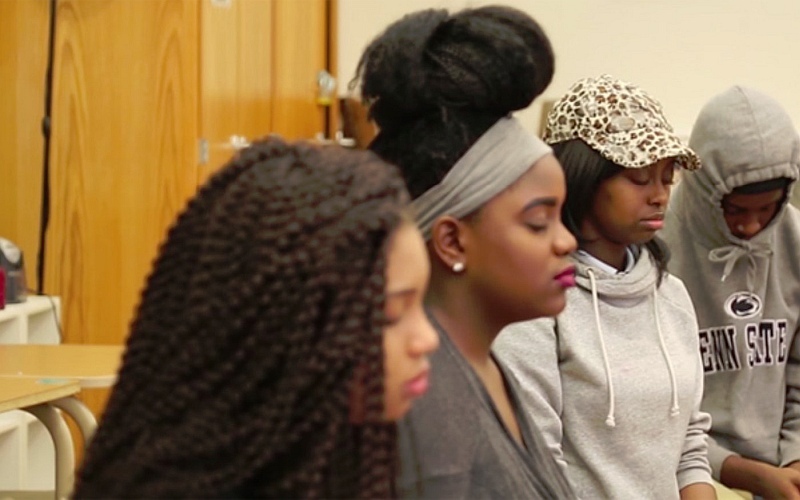 Liz Scheltens of Vox explores how mindfulness is making its way into US schools. The video begins with a demonstration from Satyani McPherson, a meditation teacher with Minds Incorporated, who leads a mindfulness session with students at Eastern High School in Washington, DC. The video also features Harvard researcher Sara Lazar, who studies how yoga and meditation impact cognitive function. Lazar talks about how she started practicing yoga after a running injury, noticed she started feeling more calm, but wasn’t sure if it was a placebo response. She decided to study the brains of people who had never meditated—first with a brain scan before they they participated in an 8-week, 30-minute meditation program. Afterwards, Lazar noticed changes in different brain regions—in particular, thickness increased in certain areas of the brain related to learning, memory, and emotion regulation (the hippocampus) as well as perspective-taking, empathy, and compassion (the temporoparietal junction). It’s not clear that students’ brains will undergo the same kinds of changes, but many schools are bringing mindfulness in the classroom: from replacing detention with meditation to building kindness into the curriculum. Bruce Gill, who runs the meditation program at Eastern High School in Washington, DC, and is Executive Director of Minds Incorporated, suggests mindfulness can give students important tools to navigate a fraught system. “We don’t want them to react in the face of a threat from a police officer in such a way that provokes something destructive happening, that provokes something fatal happening,” Gill tells Scheltens. 1) Explore the case studies: There’s a school in Dallas, Texas that has been incorporating mindfulness into their curriculum for almost 20 years and tracking their kids’ progress. They’ve accumulated significant data showing the positive effects of incorporating mindfulness into education. Their students are learning essential skills for handling stress, plus improving their memory, capacity to plan and organize, and to feel empathy, all the while improving their test scores.